Smells like… well, just spirit actually. I’m currently compiling a list of my top Autumn fragrances which naturally involves a little bit of pruning and today, I thought I’d show you one that just missed the billing. 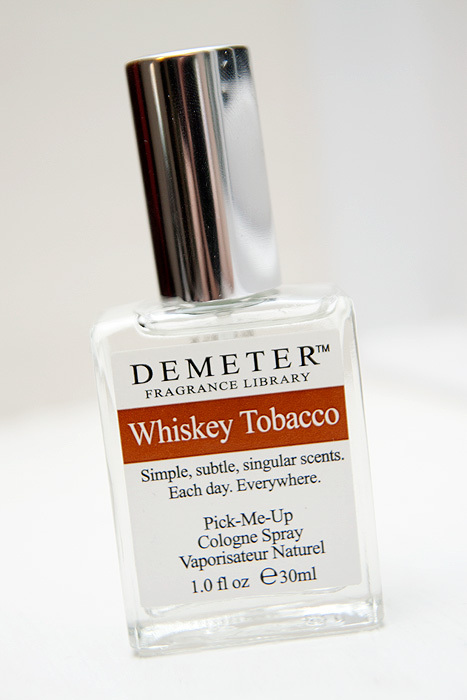 Demeter Whiskey Tobacco is a fairly recent acquisition that caught me by surprise late one night as I was browsing some fragrance sites. I love warm scents, so naturally, this time of year is like nectar to me. I can douse myself in all my boozy ambers with the kind of abandon that hasn’t been witnessed since… oooh… March? Demeter is a brand well-known for their fragrance library which encompasses many well-loved scents that would have passed under your nose at some point in time. From Apple Pie to Laundromat, Mushroom(!) to Wet Garden – the range is exhaustive AND exhausting! We think this blend of Whiskey and Tobacco Smoke is a great masculine scent. And sometime it’s nice to be reminded of your Dad. My father used to smoke a pipe and I was sure that if anyone were to capture that sweet, resinous scent unaltered and unapologetically, Demeter would probably be the ones to do it. I love tobacco scents in general and was hoping this one wouldn’t disappoint! Whiskey Tobacco, as you might imagine, is a full-on scent which I would (rubbishly) describe as less about ‘being in a smokey, boozy environment’ and more ‘alternating sticking your snout in a jar of whiskey / pouch of honeyed-tobacco’. This distinction will obviously make you less repulsive-smelling to people around you who might not share your tastes for boozy/smoky scents but I will admit to missing the actual smokiness in this one. Longevity is pretty poor, I get around 40 minutes tops before all traces have vanished into the ether. However, whilst it does linger, sillage is brilliant. Overall, it’s one to conjure memories and spritz randomly when you want a touch of (southern) comfort. Priced at around $20 it’s cheap but not super-easy to get hold of in the UK. E-scentialbeauty.com will ship internationally and also offer sample sizes on all Demeter scents so that you can try before you buy. Do you have any favourite Demeter scents? ps you must smell nice.. lots of perfume posts! Holy crapola! I used to love Dementer fragrances! You used to be able to get them in the UK from Urban Apothacary but they stopped trading a while ago I think I used to love the Ginger ones…I think they did ginger ale and fresh ginger. Mmmmmmm lovely. It would be nice to see these being sold in the UK again! My dad doesn’t smoke and doesn’t drink whiskey! Some of these scents sound really interesting, Apple Pie is right up my alley! I am sure I remember these being around when I was younger! I had to click on this when I saw the name of the fragrance-I tend to like eccentric scents like this too. I like those fireside-smelling candles too, but most people hate them. I like smoky smells too!